Politics and policy were front and center during the first day of the 29th International Convention on Monday as thousands of Teamsters lauded the union’s support for a platform that calls for more infrastructure investment and election contributions by members while calling out lawmakers who would ship jobs overseas or hamper collective bargaining. Teamsters General President Jim Hoffa told attendees the last five years have been a time of success for the union. But there is still a lot of work to be done. Kevin Moore, an International Trustee and President of Local 299, said Teamsters won’t just sit back and allow Congress to approve the TPP. 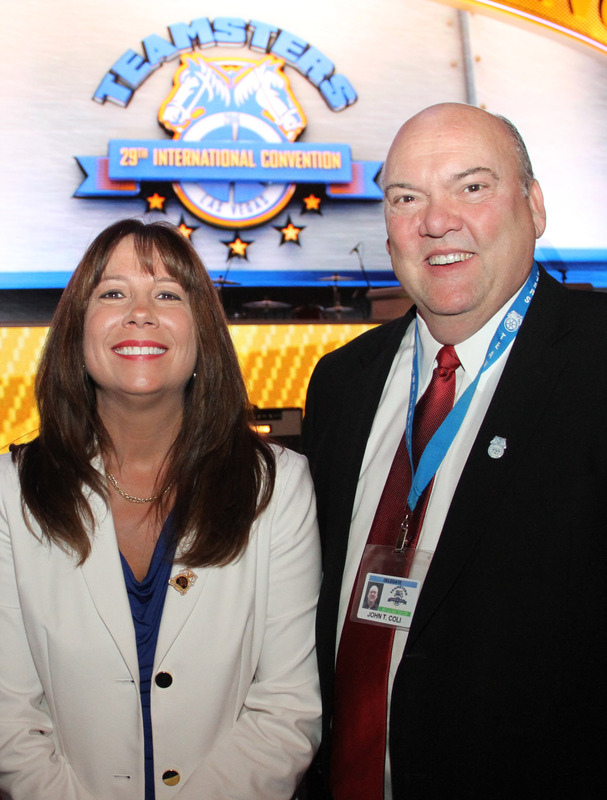 Central Region International Vice President, Teamsters Joint Council 25 Trustee and Teamsters Local 700 President Becky Strzechowski championed public employee unity within the Teamsters Union during a midday address. She specifically referenced the Friedrichs v. California Teachers Association ruling by the Supreme Court in March to rally members to stand together for stronger union rights and protections. The ruling preserved unions’ rights to collect agency fees from non-union public sector workers to cover the cost of collective bargaining and administration. Support was also strong on Monday for the union’s Let’s Get America Working platform, which was presented by Local 769 President Mike Scott. The union unveiled a broad agenda last September that called for more spending to fix roads, rail, mass transit, energy networks and water systems. Such spending would create good-paying jobs that can’t be outsourced. And members also got fired up during discussion of so-called right to work, which penalizes workers by hindering their ability to negotiate fair contracts. Lawmakers were successful in approving right to work in West Virginia this year, but pro-worker forces continue to hold off a similar result in Missouri. General Secretary-Treasurer Ken Hall said workers have the power to stop it. Local 700 Business Agent and Trustee Anthony McGee also addressed the Convention as a delegate from the floor in support of a resolution concerning all public employees. The resolution stated that all Teamsters will continue to build power in the public sector through traditional organizing and affiliations with independent associations and other unions. It further read that all Teamster locals shall implement plans to engage in ongoing internal organizing aimed at converting all fair-share payers to full membership. Near the end of the day’s proceedings, Convention attendees heard about the importance of the 2016 elections as well as the need to elect Teamsters to public office. And members approved a resolution backing increased participation in the union’s DRIVE program, which funds the union’s contributions to candidates for office. Teamsters Local 700 is an affiliate of Joint Council 25, America’s premier labor union for Chicago, Illinois and northwest Indiana.